We’re not doing so great on our one recipe a week challenge, but we are trying some new recipes, just not nearly one a week. Oh well. 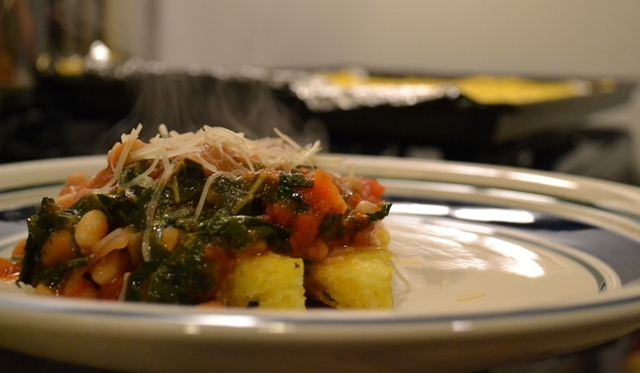 Here’s our latest new adventure: Herbed polenta with an amazing tomato sauce topping. We wanted to make polenta and I found this recipe on Care2, a website which aims to “make it easy for everyone to live a healthy, green lifestyle and impact the causes they care about most.” We made a few small changes to the recipe and, while it was pretty easy to make and the sauce was incredibly delicious, the polenta was kind of bland and not nearly as creamy and fluffy as the polenta at our favorite restaurant down the street. I know we’ll make the sauce again, but we’ll be on the lookout for a recipe that promises creamier polenta. In a 3-quart pot, combine the polenta, salt, parsley, and water, making sure there are no lumps. Bring to a boil and lower the heat and simmer, stirring frequently, 30 minutes or until the polenta is thick and comes away easily from the sides of the pot. Next grease a large sheet of aluminum foil with the oil and place it on a baking sheet. With a rubber spatula or with wet hands, slide the polenta onto the baking sheet, guiding it into a rectangle measuring approximately 8 inches by 12 inches. Make the corners as square as possible. Lay a second sheet of aluminum foil of top and allow the polenta to set for at least 30 minutes. While the polenta is setting, you can begin the sauce topping. In a large, deep frying pan, heat the oil. Add the garlic and saute until it turns golden. Add the chopped onion and saute until translucent. Add the greens and stir until wilted. 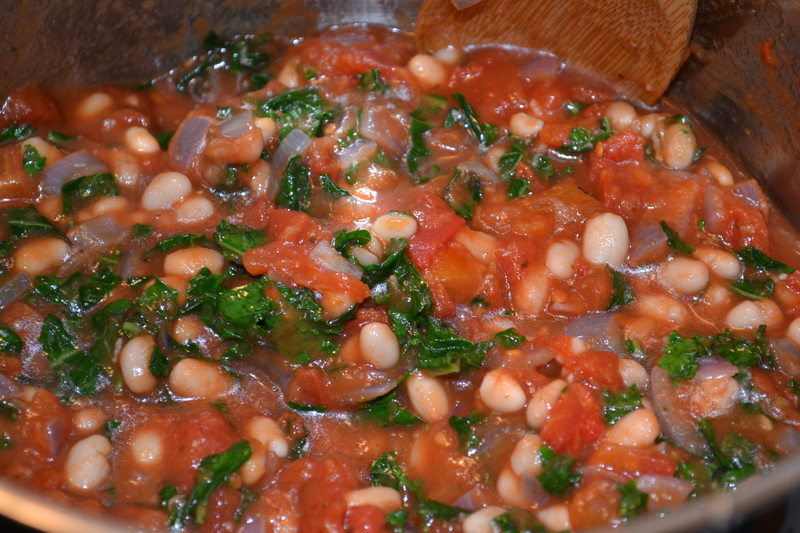 Add in the can of tomatoes with their juice, then add the beans and simmer for 15 minutes. Season with salt and pepper. 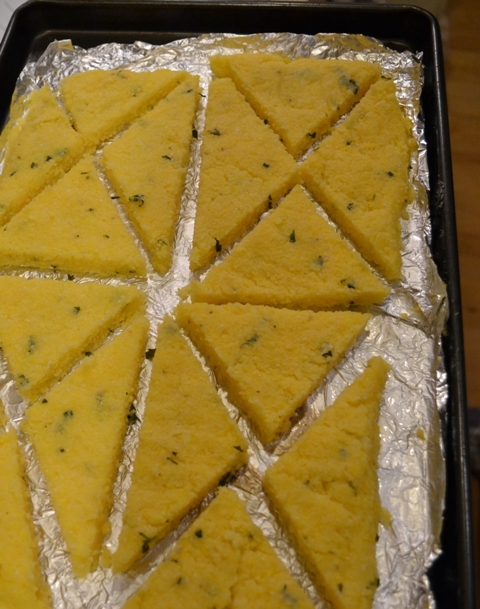 Cut the polenta in to four equal rectangles and then cut each rectangle into four triangles. Place the triangles on oiled aluminum foil and bake at 400 for 5 to 6 minutes. Flip over the triangles and bake for another 5 to 6 minutes or until they start to become brown. Put two triangles on a plate and add some shredded parmesan cheese on top. Ladle the bean mixture on top and add a bit more cheese if you’d like. Enjoy!